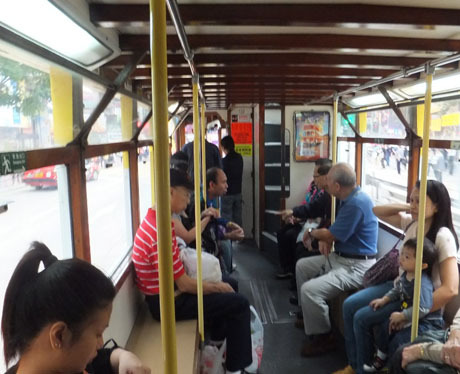 Hong Kong’s trams, affectionately known locally as "ding-ding" trams, have been rumbling along the northern side of Hong Kong Island since 1904 and provide a wonderfully inexpensive and enjoyable opportunity to experience a moving theatre of scenery and street life. The first trams were all single-deck, followed in 1912 by open-air double-deck trams and by enclosed double-deck trams in 1925. About 1,700 tram services a day operate on Monday to Saturday and about 1,900 services on Sundays and public holidays. About 74 million passengers journeys each year are made over six routes covering a total of 30 kilometers and 120 tram stops between Shau Kei Wan, Happy Valley and Kennedy Town. Fares remained unchanged for 13 years from 1998 until small increases the adult and child fares took effect on 7th June 2011, whilst a small increase in the fare for seniors was deferred until 7th June 2012. Fares are expected to increase in early 2018 subject to approval by the government. 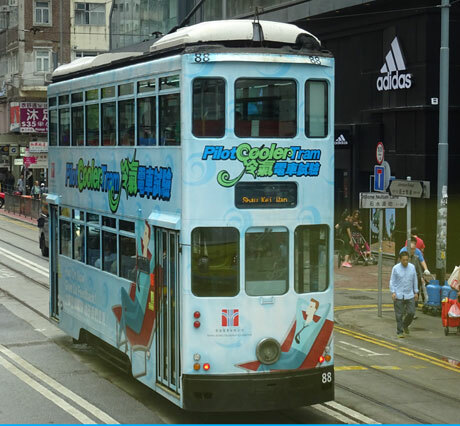 Hong Kong Tramways saw a surge in profits from around HK$2 million a year between 1996 and 2006 to about HK$30 million in 2008, mainly derived from enhanced advertising services which has seen some eye-catching graphic whole-body tram adverts. Since 2010 there has been a fall in passenger numbers and during 2014 daily patronage was about 194,000 until the opening of the MTR West Island Line between Sheung Wan and Kennedy Town in late December 2014 which by June 2016 had led to a further decline in daily patronage which has since stabilised at about 185,000. Fares will increase from 2nd July 2018 following approval by the government of an application submitted in August 2017 from Hong Kong Tramways (HKT). The increase is the first for seven years and has been granted taking into consideration various factors, including the quality and quantity of service provided, planned improvement projects of HKT; the changes in operating costs and revenue since HKT's last fare adjustment; HKT's forecasts of future costs, revenue, profit and return; and public acceptability. The adult fare will increase from HK$2.3 to HK$2.6 and child and seniors fares will increase by ten cents to HK$1.3 and HK$1.2 respectively. The cost of a monthly ticket will rise from HK$200 to HK$220 but the price of the four-day Tourist Pass will remain unchanged at HK$34. 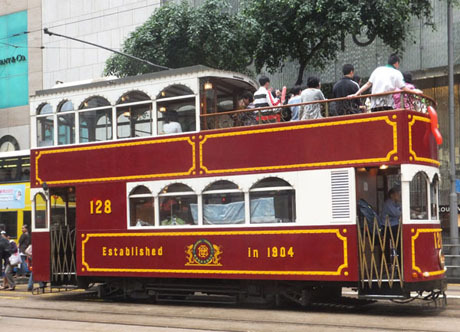 Tram services in Hong Kong are regulated by provisions of the Government's Tramways Ordinance. From 1974 Hong Kong Tramways had been operated by Wharf (Holdings) Ltd but in April 2009 Hong Kong Tramways agreed a 50/50 partnership between Wharf Transport Investments Limited (a subsidiary of The Wharf (Holdings) Limited) and Veolia Transport China Limited. Veolia Transport China, a 50-50 joint venture between Veolia Transport and RAPT Development (both major public transport operators based in France), exercised an option to purchase the remaining 50% in March 2010 to become sole owner of Hong Kong Tramways and is now wholly owned by RAPT Dev Transdev Asia which has a presence as a transport operator in 27 countries worldwide. The line extends for 13km from Kennedy Town at the western end to Shau Kei Wan on the north east coast with a 3km single-track“loop” running through the Happy Valley district of Causeway Bay. There are seven routes (detailed below) some of which overlap and trams operate from 6am until midnight although operating hours of individual routes varies. 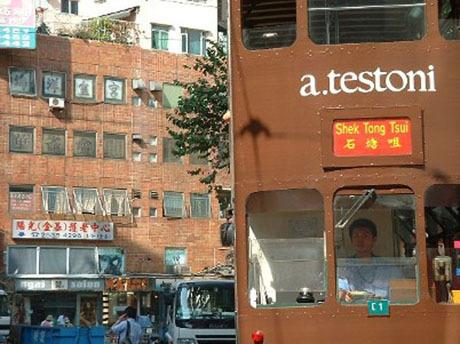 In November 2010 a new route was introduced between Shau Kei Wan terminus to Kennedy Town terminus making it possible to travel the full length of the line without changing trams. Trams on this route operate at about 30 minute intervals from 7am to 7pm with a journey time of about 90 minutes. Otherwise travelling the full length of the line is only possible by changing trams, with Western Market being a convenient interchange. The latest generation trams are capable of travelling at speeds of up to 42km per hour but speed limits of 20km/h apply to downhill sections and point switch, 15km/h for curves and at tram depots, 8km/h for L-curve turning junctions and 5km/h for auto-point switch and sections undergoing track works. Trams can be boarded at designated tram stops which are located at an average of 250 metre intervals either at roadside stops or at central road islands separating carriageways. 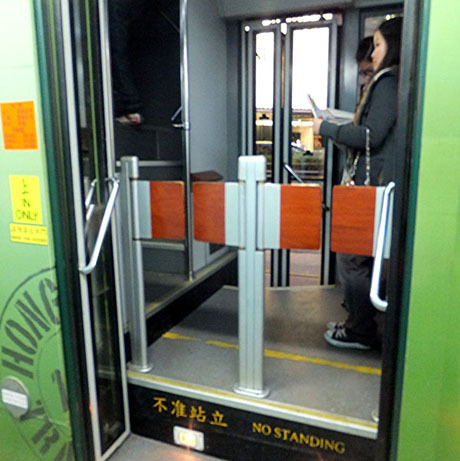 Standing in trams is allowed and is commonplace both upstairs and downstairs. A recent initiative has been the introduction of stop name and number signs on the roof of tram shelters. The rooftops of some shelters are designed to allow speedy evacuation from the tram upper deck in the event of an emergency. Having remained unchanged for 13 years, fares for adult and child (3-12) journeys increased from 7th June 2011 to HK$2.3 and HK$1.2 respectively, whilst an increase in the concessionary fare for seniors (65 and over) to HK$1.1 was deferred until 7th June 2012. Fares can be paid either by OCTOPUS CARD or in coins (no change is given). Passengers board the tram at the rear entrance via barriers or turnstiles and disembarking at the tram by the driver. Fare is paid on disembarking and the Octopus Card reader and coin box are located by the exit next to the driver. Trams run at frequent intervals (1.5 to 4 minutes) from about 6am until midnight but can be subject to “bunching” where after a longer than usual interval several may arrive in convoy. The trams are nicknamed "Ding Ding Tram", a reference to the bell used to warn traffic and pedestrians of their approach. When bells were replaced by a "beeper" in 2000 a public outcry led to the "ding-ding bells" being reintroduced. The current fleet stands at 164 double-deck trams which is the world's largest fleet of double-deck trams still in service. Trams are numbered from 1 to 166 and 168 to 170. However, either through accident or superstition tram numbers 44, 63, 71, 85, 134, 144 and 167 are missing. 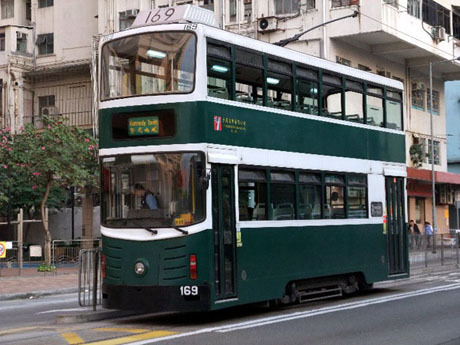 Tram number 50, which was withdrawn from service in 1991 has been preserved in its 1950's condition and is on display in Hong Kong Museum of History. There are also two antique trams, "Albert" (No 28) in green livery and "Victoria" (No 128) in maroon livery, which are for private hire with catering services and have specially designed saloons. "Victoria" has upper-deck air conditioning allowing passengers a comfortable journey on hot summer days. 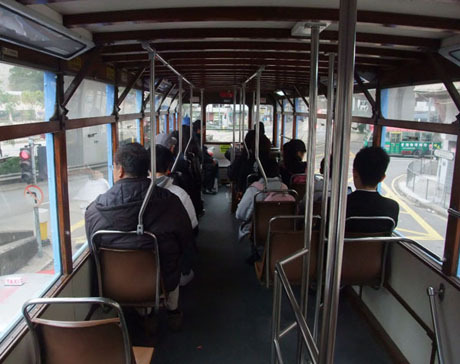 Tram 68 has been renovated and converted to an open-top "vintage" tram operating Hong Kong Tramways "TramOramic Open Top Tram Sightseeing Tour" from January 2016 (see below). Upper deck of tram 120, the only tram in the fleet which retains the original 1950's design with rattan and varnished teak seats. In 2000, a modernisation programme was commenced but only three refurbished aluminium-bodied “millennium trams”, trams 168, 169 and 170 were introduced before the programme was abandoned owing to poor public response and a preference for traditional design. The "millennium trams", which are not air-conditioned, proved to be uncomfortable for passengers in the summer heat and humidity. 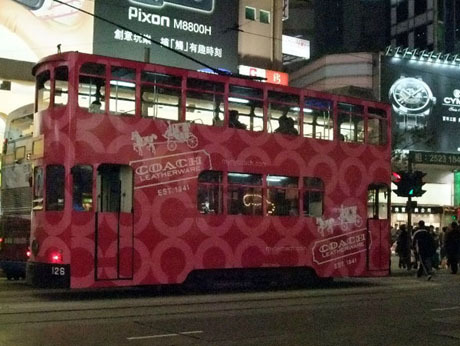 In September 2018 Hong Kong Tramways and cultural start-up Circus Limited collaborated to launch "Circus Tram" as a premium venue to supplement the two existing party trams. Tram number 18 has been renovated with articulated interior, air conditioning, high quality furniture and upholstery, light and sound system, refrigerator, washbasin, toilet, three thematic rooms suitable for reception, parties, delegation tours and festival parades for up to 36 people. Circus has curated artistic and cultural experiences with local Hong Kong talent and can provide a seasonal on-board catering menu. Circus Tram operates four times daily at 11-00, 14-30, 19-00 and 21-30 on 350 days a year between Western Market and North Point including the Happy Valley loop. In October 2010 plans were announced for the current wood-frame trams to be replaced with new aluminium-framed bodies which would be cheaper to maintain as the wood-frame trams need rebuilding about every six years. 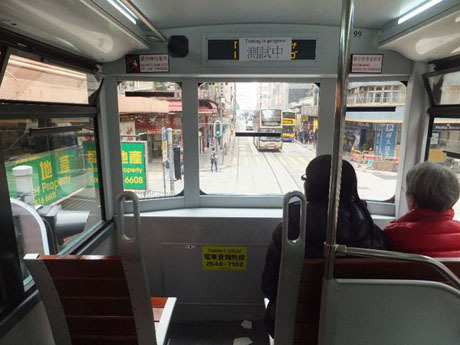 The programme, costing about HK$75 million is part of Veolia's HK$200 million investment plan for the tram network. Following a four-month study of passenger travelling habits and demand which showed demand for services is highest at the western end of the line between Wan Chai and Shau Kei Wan, Veolia Transport is proposing a revamp of services which would see faster and more frequent but shorter services at the western end of the line and less frequent services on other sections of line. There would be fewer long-distance services such as Kennedy Town to North Point but passengers would be able to transfer to connecting trams at "free transfer areas" without having to pay additional fare. However, this would be dependent on approval being granted for new tram turnarounds at areas such as Quarry Bay, Causeway Bay and Wan Chai to enable shorter routes. Tram 168 was the prototype for the "new tram" and was introduced into public service in October 2010. 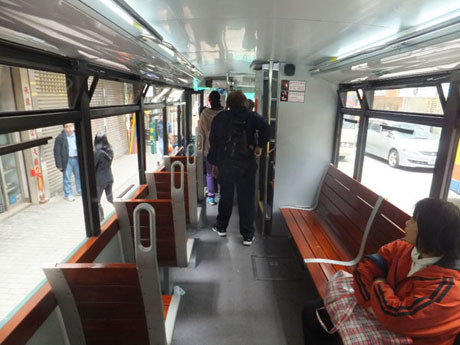 The improvements include soft LED lighting, new seating with individual seats on the lower deck replacing bench seats, next stop information displays and announcements and a new AC traction system replacing the current DC motors. 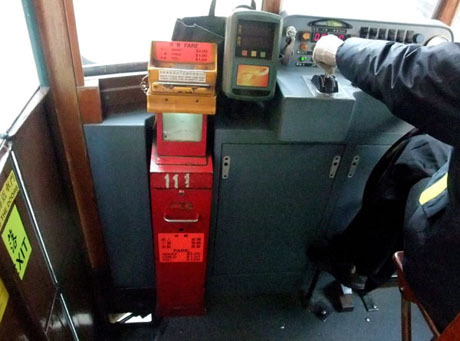 The existing entry turnstiles have been replaced with gates operated by infra-red sensors and the driver is able to monitor the rear of the tram with CCTV. The external appearance is largely unaltered except that electronic destination displays on the front, rear and sides of the trams have replaced the old handle-operated canvas destination indicators. 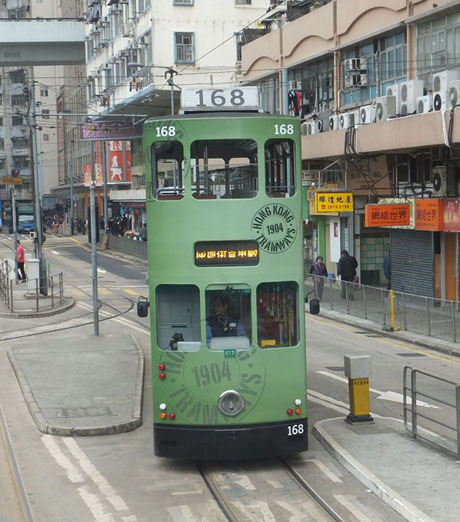 Tram 168, one of the former "millennium trams", was the prototype for the new Hong Kong tram and introduced into service in October 2010. Following successful trials and good public response to the protype, the "New Tram" was officially launched on 28th November 2011 when renovated trams 171, 173 and 174 joined tram 168 in service. By the end of 2016 about half of the fleet had been renovated. There are also plans to increase the number of trams and increase service frequency. A passenger information system has been installed at tram stops with all 118 tram stops being named and equipped with route maps. 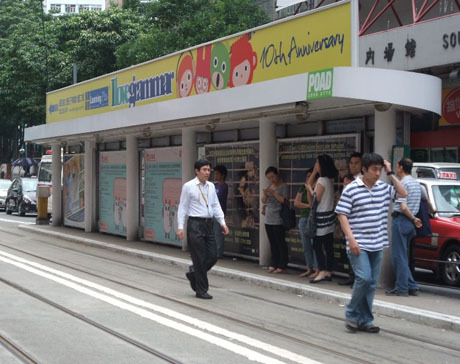 During December 2011 a HK$5 million real-time monitoring system was launched utilising about 600 electronic tags buried along the track which sense radio frequencies from antennae in the trams as they approach and leave each stop. The information is transmitted to a control centre enabling better management of tram frequency by, for example, delaying departure from stops to avoid bunching or bringing additional trams into service to plug gaps. From the summer of 2012, electronic display screens will be installed at some tram stops. Trams are also being fitted with an emergency braking system which will reduce braking distance from 14 metres to 10.5 metres in an emergency. Veolia had applied to the Transport Department in August 2010 for a fare increase of HK$0.5 which, if approved, would have been the first increase in fares for 12 years and would have resulted in a revised fare of HK$2.5 per journey. The company had stated that if the increase was granted there would be no more fare increases for at least four years. 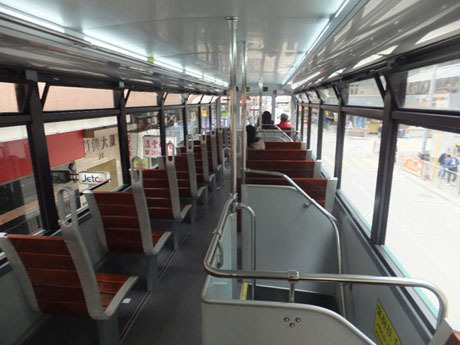 However, in May 2011, the government approved a lower increase to HK$2.3 for adults and HK$1.2 for child (3-12) from 7th June 2011 with an increase in the fare for seniors (age 65 and over) being deferred until 7th June 2012. Veolia is expecting to have refurbished 80% of its tram fleet by the end of 2014. The refurbished trams were initially deployed mainly on the western part of the line where trams now face competition from the MTR West Island Line, which opened in late 2014 and which has resulted in a drop in daily passenger numbers of about 14,000. Earlier plans for a new "tourist loop" line to run from Star Ferry Pier in Central to Hong Kong Convention and Exhibition Centre in Wan Chai on reclaimed land are still in abeyance. 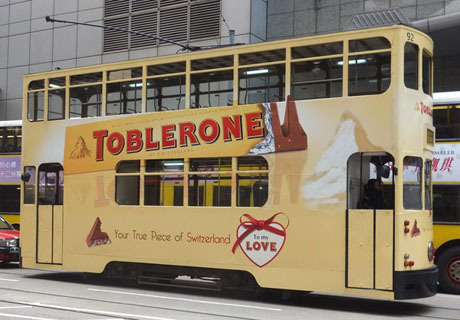 A technical feasibility study was carried out in early 2009 and Veolia was understood to be considering replica trams showing different designs of trams which have operated since 1904. A fare increase took effect from 2nd July 2018 following approval in May 2018 by the government of an application submitted in August 2017 from Hong Kong Tramways (HKT). The increase is the first for seven years and has been granted taking into consideration various factors, including the quality and quantity of service provided, planned improvement projects of HKT; the changes in operating costs and revenue since HKT's last fare adjustment; HKT's forecasts of future costs, revenue, profit and return; and public acceptability. The adult fare will increase from HK$2.3 to HK$2.6 and child and seniors fares will increase by ten cents to HK$1.3 and HK$1.2 respectively. The cost of a monthly ticket will rise from HK$200 to HK$220 but the price of the four-day Tourist Pass will remain unchanged at HK$34. Since the last fare adjustment in June 2011, owing to competition from other public transport modes, particularly the MTR Island Line extension to Kennedy Town, its patronage has been decreasing and fare revenue has diminished although daily patronage has now stabilised at about 185,000 passengers. The potential to further increase non-fare box revenue is rather limited. Although HKT made profits between 2011 and 2017, its profit after tax has been decreasing since 2014. HKT's profit after tax in 2016 and 2017 was HK$37.6 million and about HK$22.9 million respectively (the profit margin was about 14.7 % and 9 % respectively). HKT has planned to invest about HK$110 million in the next few years for implementing a series of service improvement projects which will enable the company to provide quality, efficient, cheap and environmentally friendly services. Without a fare increase, HKT estimated that its profit margin would drop to below 2.6% from 2018 and beyond. Trams are not air conditioned. However, in mid-2015 the company applied for a permit from the government to equip one tram with air conditioning under a pilot scheme to gauge public opinion as to whether to equip the whole fleet with air conditioning. Tram number 88 was chosen for the trial which ran from 6th June 2016 for a period of three months. Three temperature settings of 23, 25 and 27 Celsius were used during the trial and passengers were surveyed either on board or online to suggest which temperature to adopt. The tram operated on scheduled services throughout the trial and fares were the same as for non-air conditioned trams. Following positive public feedback the company is planning, subject to government approval, to introduce ten air conditioned trams into service in 2018 and eventually increase the number to 30 or 40. A previous trial in 2000, involving three "millennium" trams fitted with air conditioning, failed owing to constant breakdowns. 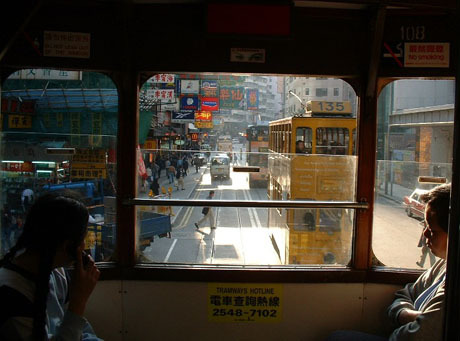 After Veolia took over Hong Kong Tramways in 2009 it indicated that it planned to fit trams with more powerful engines which would enable trams to be air conditioned. In February 2016 a HK$1.5 million programme to apply rubber coating to some sections of track to minimise noise in some neighbourhoods began. The first section to be renewed was a 100-metre trial length of track at Shau Kei Wan terminus, where the work involved covering parts of the tracks with a layer of elastic rubber before embedding it in concrete. The rubber is made in Belgium from recycled tyres and costs HK$9000 a metre and HK$5000 a metre for maintenance. Noise level is reduced by 16 to 20 decibels. Owing to cost, the rubber coating will only be applied to sections in residential areas with heavy traffic. Following the success of the trial at Shau Kei Wan a three-year programme to replace other sections of track began in early 2017 with 90-degree bends around the Kennedy Town loop being the next sections to be upgraded. 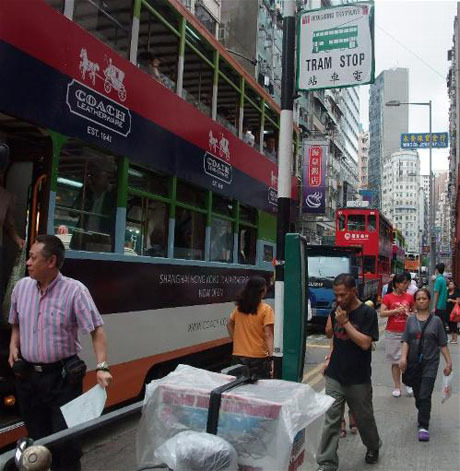 Upgrades will also be undertaken for 60-metres of track at Percival Street in Causeway Bay and 80-metres of track in Tin Lok Lane, Wan Chai during the early stages of the programme. In the Chief Executive's 2017 Policy Address it was announced that the government is to subsidise, on a matching basis, about 2.4km of track upgrades. 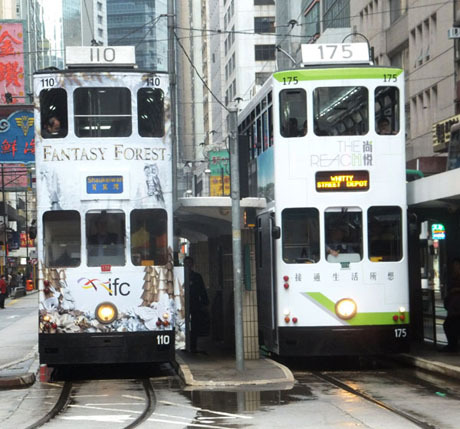 Hong Kong Tramways confirmed in March 2016 that it is teaming up with transport app Citymapper to make available free real-time positional data gathered from 600 tags buried in tram tracks since 2012 to enable passengers to get a more accurate estimate of waiting time for trams and journey time. The company is also implementing a new schedule in April 2016 which is expected to reduce tram waiting times by four per cent on weekdays, seven per cent on Saturdays and ten per cent on Sundays and is planning to develop internal software in conjunction with the Chinese University of Hong Kong to improve punctuality of trams. 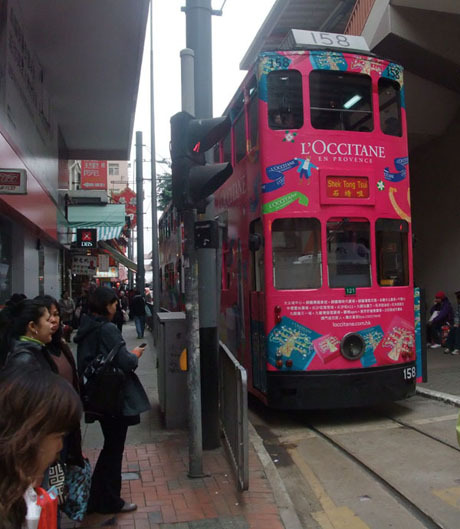 In August 2016 the company indicated was considering applying for a fare increase to assist with the cost of relocating its Causeway Bay substation which is expected to cost about HK$30 million. The substation located at Times Square, which acts a voltage converter, is to be vacated by March 2018 at the request of the landlord. Two sites on Morrison Hill Road and Causeway Road have been identified and the Town Planning Board has approved the application for the new sites. In late May 2017 Hong Kong Tramways launched a new logo and visual identity under the theme "Catch a ride, Catch a smile" to reflect the company's heritage while remaining young, cheerful and energetic at heart. The new branding replaces the old design of blue and white tram tracks on a red background which has been in use since 1974 and the new graphic system will be used on trams, on tram stop signs to make them more conspicuous, on the route map to make it clearer, website to make it more user-friendly and on other passenger materials. The new logo is based on an image of double-decker tram silhouette with the shape of a bauhinia leaf in the background and a smile on the bumper. 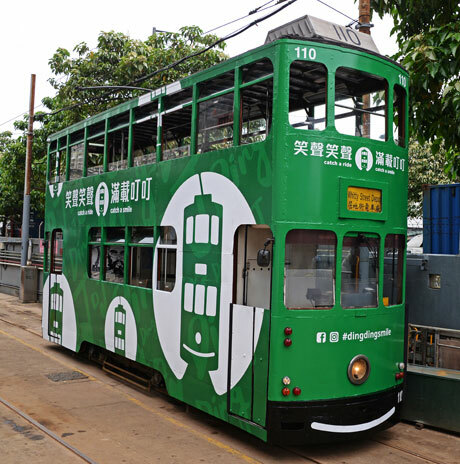 Three trams have been specially liveried to promote the new image with new logo and "Catch a ride, Catch a smile" slogan and all trams will display a smile on their bumpers for a period of three months. In early 2018 Hong Kong Tramways confirmed a major investment in replacing the bogies for the entire tram fleet over a 10 to 15 year period. The new bogies will be self-adjusting and computerised, reducing noise by up to 40%, lessening friction on the lines and saving energy as well as incorporating sensors to capture real-time data for operational analysis. Two designs are being considered with a final decision on choice expected by mid-2018 before commencement of the programme at a rate of 5 or 6 trams a year with the work being carried out "in-house". 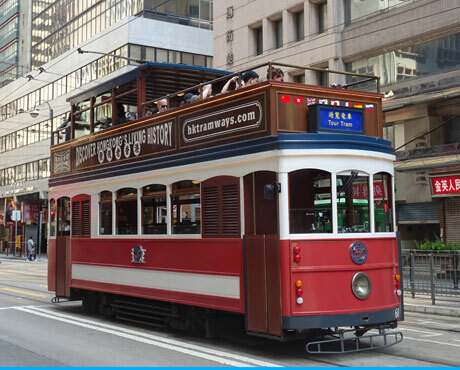 Hong Kong Tramways "TramOramic" open-top tram sightseeing tour is to commence operating from 24th January 2016. 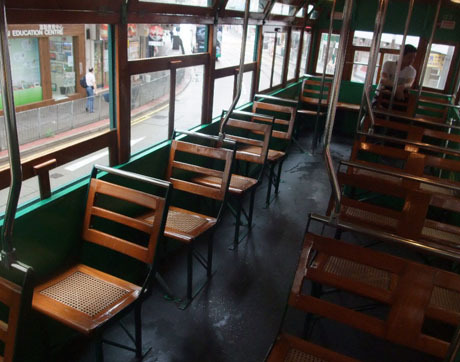 The one-hour tour in a 1920's-style open top tram offers two routes, Western Market Tram Terminus to Causeway Bay Tram Terminus via Happy Valley or Causeway Bay Tram Terminus to Western Market Tram Terminus via Happy Valley. The tour operates daily with departures from Western Market at 10-30am, 2-30pm and 6-30pm and from Causeway Bay at 11-30am, 3-35pm and 7-45pm. Take the MTR Island Line to North Point. Exit the station via Exit B2 to emerge on King’s Road. 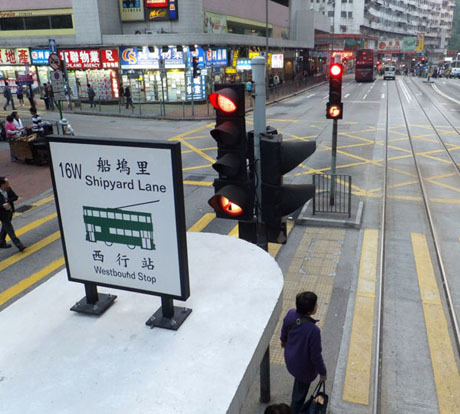 Cross King’s Road and follow it to the left for about 200 yards until reaching a junction in the tram tracks where trams emerging from the short loop to North Point Tram Terminus along Chun Yeung Street rejoin the main line. The terminus is on the left and here visitors can join an empty tram and occupy the upper deck front seats for excellent views. Passengers enter the tram through the turnstile at the rear and pay the fare either by Octopus Card or in coins at the front door by the driver on disembarking from the tram. Grandstand view of Hong Kong's street life from upper deck front seats. Trams from North Point travel to Whitty Street (where the main tram depot is located) in the Sai Ying Pun district which is just beyond Western Market near the entrance to the Western Harbour Crossing. Commencing the journey at North Point Terminus the tram swings out into the centre of the wide and busy King’s Road and rumbles through its colourful shopping district. Other than in bad weather the glass sliding tram windows are usually open and as the tram pulls alongside trams travelling in the opposite direction at tram stops it is possible to shake hands with the occupants through the open windows. Soon the tram passes Fortress Hill MTR station on the left and on the right the huge AIA Tower soars into the sky. The line originally ran right next to the coastline and what you see on your right is all built on reclaimed land. Approaching Causeway Bay Tin Hau MTR station is on the right and just beyond on the right is Victoria Park with its basketball courts and football pitches in the foreground and green space behind. On the left the tram passes the modern 12 storey Hong Kong Central Library with its neo Greco-Roman façade then passes the Causeway Bay Tram Terminus outside the Regal Hong Kong Hotel continuing its clattering journey along Yee Wo Street into the shopping district. The huge Sogo department store is on the right and from here right along the stretch to Wan Chai the trams upper deck is immersed in a forest of neon lights which at night time form a truly spectacular sight. Beyond Wan Chai the tram passes along Queensway in the Admiralty district with its modern office blocks and the prestigious Pacific Place shopping mall on the left and harbour views to the right. Onwards into Central with the 70 storey Bank of China Tower and its strange geometrical shapes dominating the skyline on the left and then continuing round the corner into Des Voeux Road past the HSBC building and on the right Statue Square and the former LegCo (Legislative Council) building which is to become the Court of Final Appeal in 2015 after renovation. The tram travels right through the heart of bustling Central along Queen's Road with its shops and offices. 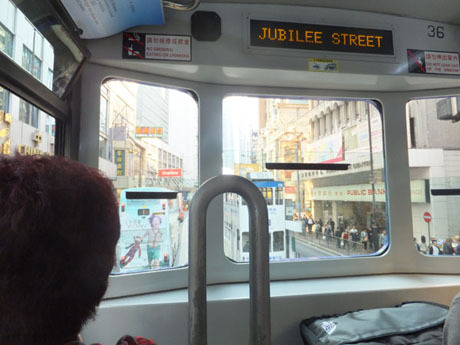 The journey continues along the full length of Des Voeux Road through Sheung Wan and reaches Western Market Tram Terminus, about 50 minutes journey time from North Point. The distinctive maroon painted Western Market is just ahead. It’s best to leave the tram at the terminus here although the tram carries on a little further alongside the flyovers and underpasses around the entrance to the Western Harbour Crossing to the depot there is nothing of too much interest to see beyond the dried seafood shops of Des Voeux Road West. Passengers wishing to continue the journey to Kennedy Town change trams here at the Western Market Terminus.